Jean-Pierre Lemonds is a Breton sharpshooter and permanent resident at the Silverhome on the Water in Bravil. Back in the day, Jean-Pierre used his skills with a bow to achieve the Champion title in the Imperial City Arena. In present day, he lives a much more secluded life, giving up the bow and only carrying around an impressive collection of arrows as proof of his former glory. On all ordinary weekdays, he sleeps in his room on the third floor until 8am, then heads downstairs to the dining area and hangs out near the bar while chatting with the other regulars. He will continue to do so until 4pm, when he finds himself a table and enjoys an early two hour dinner. After, he resumes his socializing. At the late hour of 2am, he heads back up the stairs to his room and his bed. On Loredas, after five days hanging around the same people, he wants a break and leaves the inn at 12am. He crosses the bridge to the southern part of town, enters the Lonely Suitor Lodge, and hangs out there for the entire day. 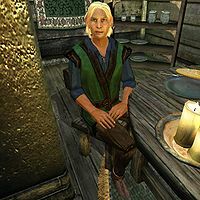 When the clock strikes midnight on Sundas, he leaves the Lodge and returns to the Silverhome lodge at his 2am bedtime. Sundas is his hunting day; he gets out of bed at 6am and leaves Bravil for a long day of deer hunting, accompanied by fellow archer and owner of The Archer's Paradox, Daenlin. They will hunt together on the roads and paths connecting Bravil and the Flooded Mine, and even though Daenlin leaves early at 8am to open up his shop, Jean-Pierre keeps hunting for another twelve hours, before finally returning to Silverhome and his regular routines. Jean-Pierre carries five steel arrows and has a 50% chance of carrying leveled enchanted arrows. He wears a blue & green outfit and a pair of thick cowhide shoes. His only other possession is a leveled amount of gold.